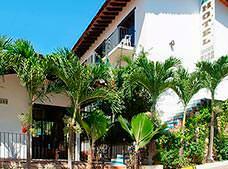 Vallarta Sun Hotel is located in the romantic area of Puerto Vallarta, surrounded by restaurants and shops. This property is ideal for those seeking a place with easy access to the beach and to many attractions in this paradisiac destination. The hotel offers affordable rates and air-conditioned guestrooms with a microwave and a mini-fridge. Vallarta Sun Hotel also features a swimming pool, a snack bar and complimentary Wi-Fi. Enjoy a pleasant stay in these air-conditioned rooms which feature a charming decoration and rustic-style furnishings, as well as convenient amenities, such as a mini-fridge, a microwave, cable television, a coffee maker, a safe deposit box and complimentary Wi-Fi.